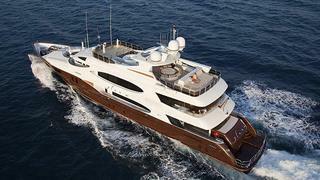 Sergei Dobroserdov at Nakhimov Yachts sends word that he's listed the 49.1m motor yacht Glaze. Launched in 2007 by Trinity Yachts, Glaze had a full refit in 2010 including new paint, soft furnishings and an overhaul of engines and generators. MCA compliant, she accommodates up to 12 guests in five staterooms and features an eye-catching spiral staircase that sweeps through the middle of the yacht, connecting all three decks. Twin 2250hp Caterpillar engines give her a cruising speed of 15 knots. Glaze is asking €17.9 million.